Alberto Fabiani (1910) ~~ Best known for his uncluttered designs with clean tailoring, he became famous for his tent coats in the 1960's. He married fashion designer Simonetta and briefly worked in conjunction with her in 1962 in Paris until their divorce. He continued to design until his retirement in 1974. This late 1960's design features a high-fitted and slightly flared dress in above or mid-knee length with a bias collar and front bias inset. 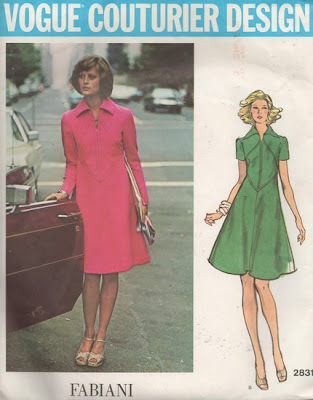 The dress has a front zipper closing and shaped back bodice.